November 9, 2017 from 6:15 p.m. to 8:45 p.m.
— Alicia Garza, activist, quoted by Jelani Cobb in “The Matter of Black Lives” in The New Yorker. As Jelani Cobb details in The New Yorker, the #BlackLivesMatter hashtag was born of a Facebook post by Alicia Garza that went viral in July 2013, right after George Zimmerman’s acquittal at his trial in Florida for the homicide of Trayvon Martin. Garza’s partner, Patrisse Cullors, took a snippet from that post, added the hashtag, and thereby created one of the most important political memes of the 21st century: #BlackLivesMatter. Another acquaintance, Opal Tometi in Brooklyn, developed a social media platform to deploy the term and connect the emerging networks of activists. Although the movement is still emerging and young, as a historical matter, it has already undergone change over the past few years and is still today somewhat difficult to delineate exactly. It consists of a range of activism, extending from individual acts of resistance, to local collectives, to national organizations, all self-identifying as part of a broader movement for Black lives, anti-racism, and racial justice. The key element is self identification. There is no authoritative policing, no institutional judge of who can legitimately claim to be part of the movement, and perhaps as a result, the edges and boundaries of the movement remain somewhat fluid. There is, on the one hand, the hashtag #BlackLivesMatter itself that is a unique phenomenon and does an enormous amount of work on its own. It might be worth stopping here for a moment—on the hashtag itself—to explore how this phenomenon represents a new form of uprising and how it challenges the very notion of a movement. The hashtag is a radical new form of politics, in large part because anyone can deploy it. The hashtag resists appropriation. It can spread on its own, and has a certain malleability, so that it can be redeployed in different and new contexts of anti-racist protest. As a result, it can be seen pervasively and has a certain resilience. It does not allow for the identification of leaders. And it resists the organizational form, since the hashtag, almost in its identity, resists appropriation. On the other hand, there are a number of local organizations (in Chicago, for instance, Assata’s Daughters, We Charge Genocide, Black Lives Matter–Chicago, and Peoples Response Team) and national organizations like the Black Lives Matter Global Network (that traces back to Alicia Garza, Patrisse Cullors, and Opal Tometi) or Black Youth Project 100, as well as over 30 chapters of #BlackLivesMatter across the country, that are now coalescing into a larger national Movement for Black Lives with specific policy platforms. These groups vary somewhat in their organization and leadership. But one thing that seems to united them all is a commitment to avoiding the model of the single heroic male leader that is so common to prior movements and revolutions—from Robespierre and Danton, to George Washington and Thomas Jefferson, to Marx and Lenin, to Mao, Ghandi, and Che Guevara, to Martin Luther King Jr. and Malcolm X. There is hardly a modern revolution or revolutionary project that is not associated with a great man. Black liberation movements in this country have created room, space, and leadership mostly for Black heterosexual, cisgender men—leaving women, queer and transgender people, and others either out of the movement or in the background to move the work forward with little or no recognition. As a network, we have always recognized the need to center the leadership of women and queer and trans people. To maximize our movement muscle, and to be intentional about not replicating harmful practices that excluded so many in past movements for liberation, we made a commitment to placing those at the margins closer to the center. This is, in Ransby’s words, a “better model for social movements,” and it represents “a choice, not a deficiency.” The reason that it represents a better model, Ransby argues, is that it turns over the decision making to those people on the ground who have the best understanding of the problems they face and who are in the best position to carry out their own solutions. “People are better prepared to carry out solutions they themselves created, instead of ones handed down by national leaders unfamiliar with realities in local communities,” Ransby writes. 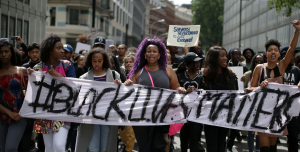 The Movement for Black Lives has now expanded from police killings to much broader issues of racial and gender and trans justice. And as Jelani Cobb shows, the movement and organizations are pushing in new directions, getting involved in public policy platforms, some even going into the electoral fray, such as DeRay McKesson who ran a mayoral campaign in Baltimore. If the Arab Spring was a test of the place of social media in an uprising, as we heard in the last seminar Uprising 3/13, then the hashtag #BlackLivesMatter and the many local and national organizations in the movement for Black lives represent a whole new way to deploy the digital age to resist and organize. Our challenge in studying these new forms and organizations will be to do justice to all the different dimensions of the new movement for Black lives.